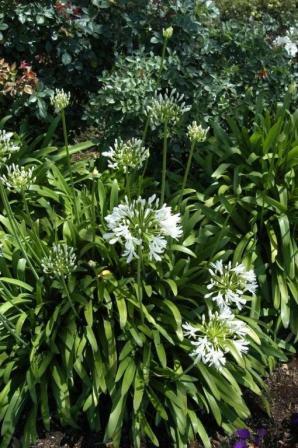 HABIT: Agapanthus forms clumps of strap-like, usually curved leaves which grow from a base of fleshy, tuberous roots. Leaves are colored in several shades of green as well as variegated. Their length and width can vary considerably. Deep violet blue flowers or white, clusters on long stems, blooms from early summer until the beginning of autumn. CULTURE: Needs moist, high organic matter content soils and good drainage. Does well in pots. Generous watering and regular feeding with fertilizer are desirable. Be careful not to let the soil get dry. Good drainage is a must - likes being watered well, but loathes wet feet. PROBLEMS: Poor drainage will rot plants. NOTE: Native to South Africa.